Nine seniors received National Merit Scholarship honors. Ben Kaplan and Sundari Bales were National Merit Finalists, scoring in the top 1% of students taking the test nationally. Sundari Bales received a National Merit Scholarship to attend Lewis and Clark University in Portland, Oregon. Melissa Huffsmith and David Masover were semifinalists, also scoring in the top 1% nationally. Tracy Clark, Jeremy Jones, Narayana Windenberger from the Boys School and Divindy Grant and Tasha Blitz from the Girls School were Commended Scholars, scoring in the top 5% nationally. Science teacher Mary Tarnoff won the Alan B. Adams Meritorious Achievement Award. Parsha Hobbs won the Discovery Young Scientist Challenge award, First Place in the Junior Biological category, and the Grand Prize Junior Championship. Lucas James, Josh Posner, and Yale Shaw won First Place. Mollie Cutler and Maria Aalto won Second Place. Mira Moore won Honorable Mention. Mollie Cutler and Leya Alderfer won special awards. The Mathematical Association of America honored Jeremy Jones, Dhruv Kar, and Noah Caplan with Certificates of Distinction and Certificates of Merit for their achievements in the American Invitational Mathematics Examination. Noah Caplan also received a Certificate of Honor, which is the highest distinction awarded in this competition. Noah Caplan also recently won first place in the Class E Junior Chess Championship sponsored by the Iowa State Chess Association. Our Lower School Math Team of Wesley Folz and Derek Thatcher from the Boys School and Coco Clark and Joella Travis from the Girls School won first place in the Area Math Bee. Wesley Folz also won the First-Place Trophy in individual competition. Six Middle School students won awards in the National History Day District Competition among 91 students from seven school districts. Winners are seventh graders Gabrielle Lamoureaux, Angela Sickler, Kenzie Wachnov, Sophie Blitz, Holly Armstrong, and sixth grader Atreya Dey. Our students went out on six trips this year to bring their message of peace to students and educators around the country. They gave presentations at two Stress-Free Schools Conferences in the San Francisco Bay area and spoke at the Student Leadership Conference at Soka University in Southern California on the topic: “Create Inner Peace for Success.” They wrote, filmed, and edited an award-winning public service announcement for KTVO—Fox TV in Ottumwa. They cosponsored a Peace Conference at Maharishi University of Management and hosted as featured speakers film producer David Lynch and a former secretary general to the United Nations. They welcomed tribal officials from Native American reservations to Maharishi School and were warmly received by students and educators at reservations in New Mexico and South Dakota. Their outreach has been instrumental not only in introducing but also in implementing programs of Consciousness-Based education for Native American students. View video about "End School Violence Now"
In 2004 the Maharishi School greenhouse won the Organic Silver Award from the Rodale Institute for the permaculture style of garden in the greenhouse. The story of this award can be found at the Rodale Institute’s website for children at http://www.kidsregen.org/gardens/2004/maharishi.php. Senior Jason Walls was honored by the Iowa Poetry Association and his poem was published last fall in the prestigious journal Lyrical Iowa. 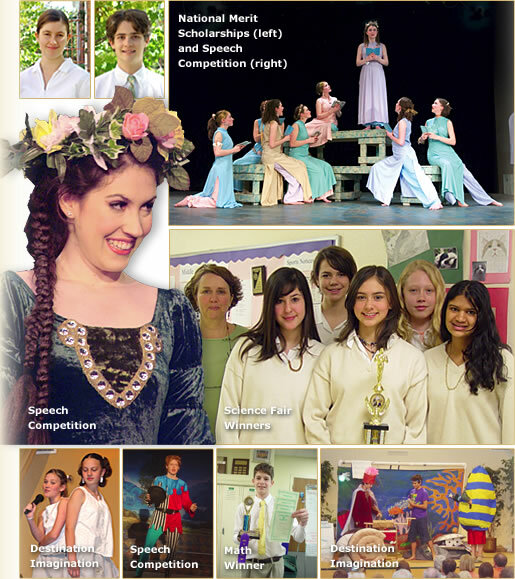 During the 2004–2005 school year, our students won 29 awards in art and photography. In international competition, graduating senior Anni Thompson received an Exhibitor Award from the Photo Imaging Educational Association. Out of 5,500 entries, her photograph was among the top 100 or so photographs that will be exhibited on four continents over the next three years. In national competition, our students won 16 awards, including first place in color photography for graduating senior Kirsi Marcus and first place in black and white for graduating senior Taylor Butterfield. In Superconference competition, our Upper School students won four photography awards including First Place and Best of Show for graduating senior Zach Nichols and five art awards including First Place in Sculpture for rising Junior Luke Stenger and First Place in Chromatic Drawing for graduating Senior, Melodia Morales. During the last two years, several of our students have won memberships in the State Honors Choir and State Honors Orchestra and eight students won membership in GOVAP, a regional honors choir. Three of our sixth graders performed with the Iowa Dance Company. Maharishi School has won more Critic’s Choice Awards at the All-State Iowa High School Speech Association competition than any other school in Iowa. This year, the All-State Banner went to our Radio Broadcast Team which included rising sophomores Lanie Goldstein, David Fulcher, and Nathaniel Alexander. After their performance the judge remarked that that was what he had been waiting for all day. “These students blew me away.” Three other teams won Outstanding Performers honors (for musical theater, group mime and solo mime) and another musical theater team won Special Recognition honors. This year seven Maharishi School teams won first-place state championships and went on to compete at the Global Finals in Knoxville, Tennessee, where they earned two first-place awards, two second-place awards, and a prestigious Renaissance Award for technical genius in sound effects and set design. Our girls varsity team won their second consecutive District Championship and rising senior Sophia Iwobi was named to the all-conference first team, the district first team, and the all-state second team. On our boys team, graduating senior John Armstrong was named all-conference Player of the Year. Both our boys and our girls teams won the District Championship this year. Both teams went on to win Regional Championships and both won the #3 rank at State. Twins Coral and Melodia Morales won the #3 doubles rank at State. In state singles play, Avery Gibson ranked #5 and Jeremy Jones ranked #7. Rising Senior Justine Rocca won several meets and set new school records twice in the 800-meter dash. Graduating senior John Armstrong won first place in a long jump competition held at Fairfield High School.